Everywhere you look in the West, you find political pygmies rather than statesmen. In France, we see a pathetic man whose own people intensely dislike, François Hollande, attempting to speak as though he were something other than a dry, pompous school teacher-like purveyor of American views. Almost forgotten are the strong, independent voices of a de Gaulle or a Chirac. In Britain, the Prime Minister, David Cameron, is a wishy-washy man of little integrity and less ability, again a purveyor of American views, and I’m sure he goes to sleep every night fantasizing about the last Prime Minister who faithfully served American interests, Tony Blair, being showered with gold, resembling something from the Arabian Nights, every year since his retirement. The United States is represented by a man of not one achievement, unless you count instituting an industrial-scale system of extrajudicial killing, sending missiles against women and children and mere suspects, a man who serves the American military-intelligence complex as doggedly as George Bush, surely the most [willfully] ignorant and cowardly man ever to be called President. Germany has a leader of considerable ability in Angela Merkel, but, as few people understand, Germany acts only under the most onerous secret agreements imposed by America after World War II, its independence still heavily constrained nearly three-quarters of a century later. No, Putin stands out, for his independence of mind, keen intelligence, ability to make decisions, and his readiness to act in proportion to the threat of a situation. In Syria he blunted America’s effort to bomb its government into submission, a la Libya. In Ukraine, he has acted appropriately and without excess, quietly taking steps to secure a region whose population includes a majority of Russians and where Russia has a major naval base and longstanding interests and relationships. The bellowing we hear from the United States about “Russia is committing a breach of international law,” or “You just don’t invade a country on phony pretext in order to assert your interest!” should amuse the world rather than arouse it. These words come from the folks who slaughtered 3 million Vietnamese, precipitated the deaths of more than a million Cambodians through de-stabilizing secret invasions, killed a million Iraqis, killed tens of thousands in Afghanistan, invaded Grenada, invaded Haiti, invaded Panama, overturned democratic governments in Chile, Iran, and Guatemala, fought a years-long secret terror war against Cuba, supported the 1965 genocide in Indonesia with lists of names of communist suspects for killing after the fall of Sukarno, and today finds itself murdering strangers by the thousands in Yemen, Somalia, Afghanistan, and Pakistan. It tolerates brutal suppression in Israel, Egypt, Saudi Arabia, and other places. The establishment in Washington, publically lecturing Russia despite its own blood-soaked record, apparently has utter contempt for the public’s intelligence, viewing them much as 1984’s Inner Party viewed Plebs. 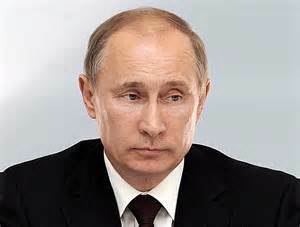 To hear Obama and the droning, tiresome John Kerry talk, you’d think Putin had recklessly hurled the world into danger. Of course, what their strained rhetoric really is telling us is that, just after a round of champagne toasts and patting themselves on the back over the presumed success of having secretly de-stabilized Ukraine for Western interests, they are seriously annoyed by Putin acting swiftly and decisively to secure an insecure situation. Most people don’t like being shown up in public, but when you get to the level of a Kerry or an Obama, being shown up in public is plainly infuriating. And, of course, it makes so much sense to be cutting off avenues of discussion, such as Russia’s G-8 meeting, talking of “going to the hilt” as Kerry has foolishly done, and threatening serious reprisals if Russia fails to do as Washington wishes. Yulia Tymoshenko, the corrupt oligarch and fascistic beauty being hailed by the new leaders as an iconic “democrat” well deserved her incarceration. Don’t expect the US media to explain what her true political lineage is. 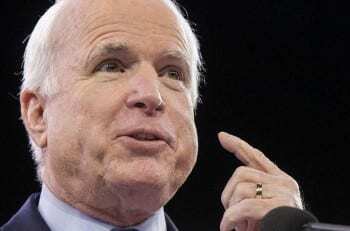 McCain: Unrepentant meddler and warmonger for decades and a darling of the American media. This compulsively self-promoting mediocrity is a plutocrat by dint of marriage. Posted in AMERICAN BRAINWASH, GUEST AUTHOR, IDEOLOGICAL COMBAT, LIES AND PROPAGANDA. Putin had significant training and experience while in the KGB. Unfortunately most other leader have little or none. Including Obama. Neither has his staff or anyone in Congress. Leading a country should require apprenticeship as well as experience. Maybe even having to spend time in other countries. It seems that the plutocracy and the parties prefer to have novices in the White House. Much easier to manipulate I would think. I would have hoped that Obama had a bit more finesse than he has shown. Didn’t expect much beyond bullying from Shrub. Or Obama..he did a stint in the CIA as well.